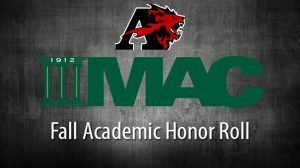 ANNVILLE, Pa. – The Middle Atlantic Conference named 1,447 student-athletes to the 2018 Fall Academic Honor Roll with 47 student-athletes from Albright College earning recognition. To be eligible for the Academic Honor Roll team, a student-athlete must have had at least a 3.20 grade-point average in the fall semester and be an outstanding contributor on the playing field. Five of Albright’s selections earned a perfect 4.0 in the classroom while excelling in their respective sports. These student-athletes were selected by the league sports information directors. The Lions have representatives from men’s cross country, women’s cross country, field hockey, football, men’s soccer, women’s soccer and women’s volleyball.